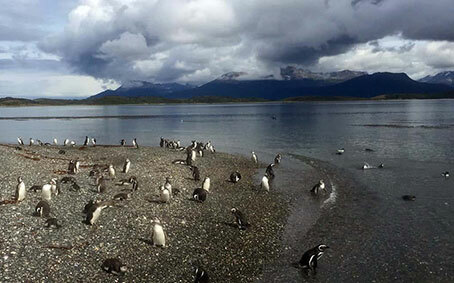 This full-day excursion takes passengers for a ride, to navigate, to walk and to make discoveries in one of the roughest and most beautiful places in Beagle Channel. Once we arrive to Lasiphashaj river, and wearing rubber boots, overpants and life-jackets provided by us, the group starts a canoeing adventure down the river that leads into the sea. 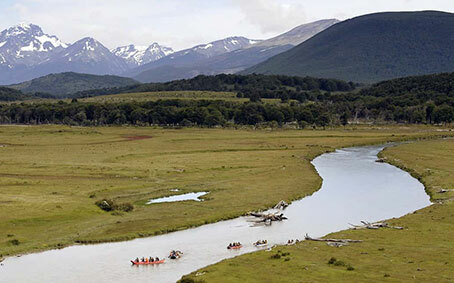 Once canoeing on the Beagle Channel, we set course to the ranch. Along the way we may encounter wildlife: lots of different sea birds. Also, it is not unusual to find sea lions sunbathing in little islands in our way to Harberton port. After 2 hours on the rafts and a short stop on mainland, we leave on a motor boat towards Martillo Island, where we will have the chance to see penguins in their breeding lair. Then the motor boat take us to our main atraccion at Gable Island, where we have some snacks, good wine and a delicious meal. 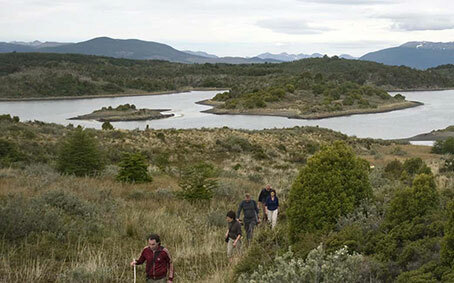 After a nice cup of cofee were go for a hike to know more of this gorgeous island, crossing over beaver damms and through the forest to reach the Beagle Channel shore where we will take the boat to start our return to Ushuaia. 8:00/8:30 Pick up from the hotel. 12:15 End of canoeing. Arrival to Harberton Ranch. 12:30 Navigation bound towards the penguin rookery at Martillo Island and Gable Island. 13:10 departure to Gable Island. 13:30 Arrival an disembark on Gable Island. 17:00 Sailing back to Harberton Ranch and ride back to Ushuaia.